Prestwick, this new nursing home has been built with the comfort and quality of life of its residents in minds. The home comprises of eighty eight bedrooms, all with en-suite facilities, split into four wings over two floors, serviced by two lifts. 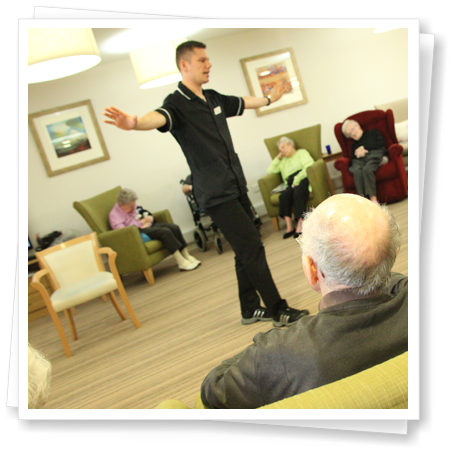 A friendly residential setting within a care home environment. A quality of life which enable them to retain their independence & identity. Stimulation and encourage participation in activities. Physiotherapy and emotional support to residents, family and friends. Involvement for relatives and friends in the day to day lives of residents. The best possible care to all residents at all times. Heathfield House has three activity co-ordinators and we have developed a programme of activities including the ones on the right. All our activities are designed around our residents, their hobbies, seasons of the year etc which encourages participation and socialisation of as many residents as possible.